Kitchen and Residential Design: An encore appearance of "This Is a Scam"
I'm filing this one under "how-to," as in how to avoid being scammed. I retrieved an e-mail bearing this coupon from my spam filter on Monday and I just want to do a little public service here. To evaluate the pitch, we went undercover at two DirectBuy franchises in New York. Both gave us the same hard sell and offers of up to 70 percent off retail prices if we were to join. Only after an hour and a half of sales pitches and video testimonials from members did we learn the membership fee: $4,900 to $4,990 (plus tax) for three years and then $190 a year for seven more. Financing is available at 17.75 percent. After the fee disclosure, we discovered that we had to sign up on the spot or never come back. 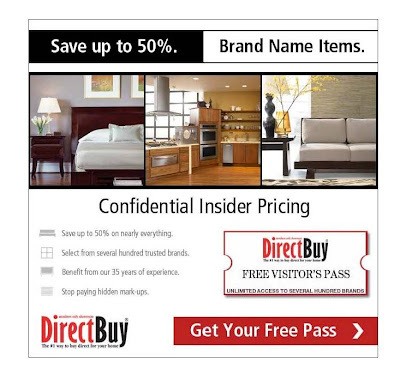 We couldn’t bring DirectBuy’s “confidential” prices elsewhere to comparison shop, the representatives said, because this would likely anger retailers who might then retaliate against the manufacturers by refusing to sell their merchandise. The fine print in the DirectBuy contract says you cannot return items, cancel orders, or terminate your membership. When we asked if, after plunking down $5,000, we could cancel and get a refund, a salesperson said, “You’ll have to check state law.” A review of New York state law revealed that the three-day cooling-off period for canceling contracts wouldn’t apply in this case. Tacked onto the cost of merchandise—which you select from catalogs since DirectBuy has limited showrooms—are a 6 percent handling fee, shipping fees, and tax. Goods are typically shipped only to your local center, so you might pay additional fees to actually get your new stuff home. All of this hoopla and added expense so that you can buy stuff at what end up being typical retail prices. Don't believe the hype. Do yourself a favor and study before you make a major purchase or better yet, train yourself to shop for value instead of price. Do all of that yes, but for the love of God, stay away from these people. When we first moved back to Indianapolis I called to visit the Direct Buy here b/c I had never been to one and was wondering what their deal was. They were adamant about me not bringing my child with me when I came in for the big pitch. I never went b/c I was not going to get a babysitter to go check out a club I was not going to join. I believe there are places where it is best not to bring your children, but I have found that how the people in business handle the request for no children speaks volumes of how they do business. I do wish I could go spy on them though so I could laugh at their "business model". I have never heard of a happy ending with these people. Thanks for sharing this Paul! I get a "free invitation" for a one-day excursion into their showroom at least once a week in my inbox. Fortunately, their closest showroom is a couple hours drive away, so I've never been tempted. More proof of the old adage: "If it sounds too good to be true, then..."
The discounts they advertise are discounts off of list prices. Using that measure, everyone's a wholesaler! I just noticed that there's a Google Adsense ad for Direct Buy running under this article. Hah! Hey Paul, Just stumbled onto your blog. Love it!!! I am a kitchen designer in California. Love your stories. I will be coming back regularly. Got to be a civilian spy in Direct Buy. They wanted to rep a company that I am do all of the deign work for. Wonderful custom cabinets brought in from Indonesia. Very "NOW" for the beach/island look here on the coast. They wanted me to design the display so I think I am one of he only people to get through the door without them trying to pitch their set-up to. People that are looking at joining them should ask themselves" Why would reputable companies market to them and undercut their other distributers. Why do you think you are going to get such a good deal form them that you can't get at a local dealer." People need to do their homework. Don't be taken in by these guys. Sue: Welcome to K&RD; you do really beautiful work. I know a couple of designer bloggers in your part of the world. I think their business model preys on the general public's ignorance of how things like cabinetry, furniture, appliances and the rest are distributed. There's an idea out there that those of us in the distribution networks are some kind of an unholy cabal bent on screwing people at every turn. That's patently false of course and what really burns me up is when a real unholy cabal like Direct Buy is the one making the accusation. Grrr. Our government is busily allowing businesses to police themselves, the lasting legacy of Ronald Reagan. Any nominal discount they offer is more than offset by the $5000 membership fees. Unfortunately for your friends, Direct Buy's contracts can't be cancelled or refunded. Thanks for the kind words Paul. I have talked to a few bloggers out here. In fact I am off to Brooke's shop tomorrow. From Velvet and Linen. Tell Brooke I said hello!